As Russia celebrates Orthodox Christmas, the Patriarch of Moscow and All Russia, Kirill, has delivered his traditional address to believers. He said he prays for peace in Ukraine above all. As millions of worshippers across Russia gathered for Christmas night liturgies on January 6, Patriarch Kirill addressed the Orthodox community with words of peace, paying special attention to the conflict in Ukraine. “On these holy Christmas days, the prayers of the whole Church and my augmented litany are for peace on the Ukrainian soil,” Kirill said in his address. He added that “regardless of the place of residence of its children, their political views or preferences,” the Russian Orthodox Church is doing everything possible to bring people together to help them overcome the consequences of conflicts. 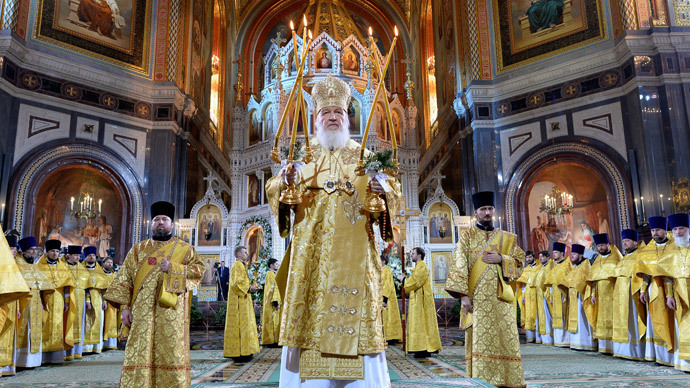 Patriarch Kirill mentioned that 2015 is the year in which the Orthodox Church celebrates 1,000 years since the death of Vladimir the Great, the ruler who baptized Kievan Rus’ in the 9th century. He pointed out that Ukrainians and Russians are bound by centuries-old spiritual and cultural ties which cannot be broken by any “external forces.” Orthodox Christianity remains the main religion of Ukraine. The Russian president remained faithful to the tradition of celebrating Orthodox Christmas in small churches. On the night of January 7, Vladimir Putin took part in the Christmas service at the Church of the Intercession of the Holy Virgin in the village of Otradnoye, near the southern city of Voronezh, some 600 kilometers from Moscow. Parishioners this year, along with local residents, were the children from the orphanage at the Church. The place of worship, which is included in the list of cultural heritage sites, can accommodate up to 450 members. It was built in 1901 but after 29 years of service, was closed, so the building was used as a granary. Work to restore the cathedral began in 1991 and was finished in the early 2000s. The Orthodox Church follows the Julian Calendar, which is 13 days behind the Gregorian Calendar adopted by the Catholic Church. Orthodox Christians celebrate Christmas on January 7.